I breastfed my daughter until she was fifteen months old, an act that I am proud to have accomplished because it was hard work--especially since I went back to work when she was seven weeks old and had to pump to give her a supply of milk for daycare. I spent a lot of time and energy (physical and emotional) into making sure that she was nourished. But I didn't spend much time breastfeeding her in public. Since I was already pumping for work, I tended to use expressed milk when we had planned public outings. When either her hunger or our being out caught me off-guard, I would reluctantly nurse her as quickly as possible, always under a cover and often in my car, occasionally in a bathroom. I was relatively young (25), a first-time mother, living in the Midwest, who had very little exposure to breastfeeding women because virtually everyone I had seen raising infants while I was growing up had used formula, including my own mother. It was very rare for me to see someone breastfeeding in public, and the headlines about public breastfeeding were always about someone getting kicked out of a restaurant or even threatened with arrest for indecent exposure. I armed myself with my legal right to breastfeed and felt solidarity and support for the "lactivists" who were fighting for changes in public perception and legal protection, but I did little to participate in the act for myself because I was uncomfortable. Fast forward to today. My son is one week old, and nursing is going well. I've been hunkered down in my bedroom like Rapunzel in the tower, somewhat trapped by the realities of a newborn, which include everything from my physical recovery from delivery to his erratic sleeping schedule to, yes, the fact that he sometimes nurses every hour. Thinking to the very near future, though, the steps I took to avoid public breastfeeding with my daughter are not going to be practical this time around. It's not just me and an infant I have to worry about; I have an incredibly social five-year-old who is going to be home with me all summer long, and I can't expect her to be locked in my tower with me. She needs to get out of the house. We need to be at parks, zoos, and museums. And it's going to be a lot harder to corral everyone in the car so that I can nurse when we're on these outings. I'm also not pumping yet because I'm not going back to work until the end of August, and I'm in no rush to add that task to my daily schedule if I don't have to. If I have remaining hangups about public breastfeeding, I'm going to have to get over them. That left me thinking about whether or not I do have hangups about public breastfeeding. In theory, I don't. I am 100% in support of the practice in pretty much any form. Want to cover up? Great. Don't want to cover up? Also great. Want to retreat to a quiet and private corner? I completely understand. Want to stay exactly where you and nurse without otherwise disrupting your day? I completely understand that, too. But I can also feel the anxiety rumbling in the pit of my stomach about having to put this theoretical support for public breastfeeding into individual practice. My own comfort level and modesty means I'll be using a cover and trying to limit the amount of public exposure I have, and that can be awkward and clumsy (especially for someone like me, who is already kind of awkward and clumsy). I know that I'll be hyper conscious of side eyes and glares, and I'll be internally steeling myself against rude comments. The main reason why the breastfeeding/formula feeding conversation is not moving forward is because it is bogged down with this individualism. I think there are several factors behind that. Firstly, public health messages, like those promoting breastfeeding, are notoriously heavy-handed and don’t deal well with nuance. This is a shame because people’s health is actually quite nuanced. Secondly, the breastfeeding message is, in part, a marketing message attempting to compete with the marketing messages of formula companies. When you do this you invariably make women consumers. Thirdly, we live in an era when motherhood is hyper-competitive and driven by perfectionism. Everyone is trying to Get It Super Right Or Terrible Consequences Will Happen For Their Children, and everything seems to come down to mothers and their choices. This leads to conversations that over-emphasise the role of choice in outcomes and also, that invariably run into the limitations of professionalising motherhood when it is still monetarily worthless. I can’t help but be suspicious that we prioritise solutions to this work-life conflict that suit a model of workplace built around men’s lives and that consistently challenge women to find new ways of adapting without ever questioning whether our economy could be moulded just a little more fairly around care work and dependency. Because, dependence is not deviant behaviour – being young, being old, being unwell, being hurt and healing, being disabled – it’s normal life. And this is not hippy stuff; this is just finding a better way of working with capitalism. For that matter, breastfeeding is not hippy, it just is. It’s not some special gift, it’s not a sacrifice, it is just the way mammals generally feed their young. 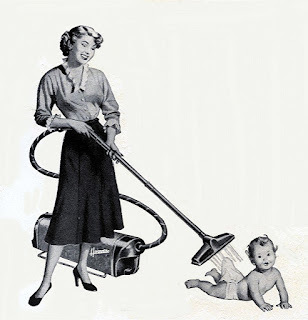 In Betty Friedan’s day, feminists felt shackled to domesticity by the unreasonably high bar for housework, the endless dusting and shopping and pushing the Hoover around—a vacuum cleaner being the obligatory prop for the “happy housewife heroine,” as Friedan sardonically called her. When I looked at the picture on the cover of Sears’s Breastfeeding Book—a lady lying down, gently smiling at her baby and still in her robe, although the sun is well up—the scales fell from my eyes: it was not the vacuum that was keeping me and my 21st-century sisters down, but another sucking sound. Rosin recounts her own frustrations with breastfeeding and the pressure she felt to continue doing it because of the popular literature insisting that "Breast is Best." Eventually, she pored over medical literature that suggested this wasn't such a clear cut case and that the outcomes of breastfeeding were only slightly better than those of formula feeding. She discusses this revelation as if she were a detective looking for the final clue, the clue that would allow her to stop breastfeeding without overwhelming guilt. Again, Rosin's choices are presented through a primarily individual lens, but when she suggests that the "Breast is Best" campaign is oppressive in the way that housekeeping standards of the 1950's were (and, I'd argue in many ways still are), she moves outside of the realm of the individual and into the socially constructed norms we must navigate as a collective, and that turn makes it clear that we were never really making these decisions as individually as we thought we were. Like all decisions, those surrounding breastfeeding are a combination of personal and communal, and we've all been influenced by the rhetorical constructs surrounding breastfeeding in both popular culture and the medical community. Rosin looks at the historical significance of the founders of La Leche League reclaiming their bodies and babies from medicalization in a way that was radical and increasingly feminist. The publication of Our Bodies, Ourselves coincided with this push for radical acceptance of the female body outside of the patriarchal structures that sexualized and scrutinized it. The fact that there was simultaneously research showing poor health outcomes for formula fed babies in South America and Africa (which were later linked to contaminated water supplies and the high costs of the formula) made for an interesting full circle. Breastfeeding had been seen as a radical departure from medicalization and the attempt for women to reclaim their bodies, but as medical literature began to circle back around to the benefits of breastfeeding, the movements found themselves realigned, and thus the "Breast is Best" campaign has a complicated history of motivations and alliances. It’s arguments like these that pretty much convince me that underneath all the pro-lactation rhetoric is a nostalgia and conservative orthodoxy that wants to affix every woman’s destiny to her biology. But as the highest-thinking creatures on Earth, isn’t the goal to move beyond the limits of our bodies? This is a fascinating argument for me, primarily because I have often felt my goals as a feminist (and, I suppose, "highest-thinking creature on Earth") have often revolved around cultivating more respect for my body and physicality in the face of a society that constantly tries to denigrate and regulate it. For me, issues like body image, fat shaming, birth control, pregnancy, and breastfeeding are feminist concerns squarely rooted in efforts to challenge the societal status quo to align with my biological and physical realities rather than force me to constantly renegotiate those spaces based on patriarchal standards. The goal has been to make space for those bodies, not to escape them. Because here is the other thing about breastfeeding. Breastfeeding is lazy. Ultimately, I came to love breastfeeding as a mother because I am quite lazy. Breastfeeding is fast food. Breastfeeding is multi-tasking. Breastfeeding is portable. Breastfeeding is unstructured and unscheduled. All of these elements are very pleasing to lazy people, like me. So, it annoys me no end as a feminist that we, as a Western culture, stigmatise breastfeeding when in the long-run it can often make mothers’ and children’s lives easier. So, yes, for some women the pressure to breastfeed may seem oppressive and stigmatizing (and I don't want to discount that pressure), but there are also pressures at work from the opposite direction. For many of us, breastfeeding is a way to make the demands of motherhood and multitasking easier, not harder, and attempts to demonize breastfeeding as a tool of the patriarchy designed to keep us trapped ignores those realities and experiences. Underpinning all of these discussions has been a strong, winding thread of capitalism. The "Best is Breast" campaign is just that (a campaign) because it is competing against formula companies. It is oversimplified, direct, and sometimes blunt because it is trying to be effective in the face of predatory advertising practices from formula manufacturers whose primary concern is profit. The World Health Organization has clear guidelines for why formula advertising is problematic, and there have been a lot of changes to the industry even just in the five years between the births of my children. I certainly was not greeted with bags of free formula in the hospital this time around, and I haven't seen a formula advertisement that didn't equally portray breastfeeding in a long time. For a closer look at this, check out this article from Rebecca Schuman that examines the history of formula advertisement and looks at the most recent Similac ads as a way to promote acceptance of each mother's personal feeding choice rather than push formula feeding over breastfeeding. In a world where formula advertisements have (voluntarily or through regulation) tamed themselves down to be much more breastfeeding-friendly, it can be hard to see the "Breast is Best" campaign as anything but overbearing, but in its inception, it was fighting much more directly against marketing forces attempting to prey on new mothers' insecurities and frustrations. Breastfeeding Today: The Selfie and "Flaunting It"
In this complex web of market forces, personal choice, public shame, and work-life balance, breastfeeding today exists on a precarious edge between them all. Perhaps this is most evident in the frequent social media and blog posts about breastfeeding as a public display of empowerment. Just last week, a photo of a mom breastfeeding at a wedding went viral and garnered international headlines. This has also been the case for viral "brelfies" like these of a woman tandem feeding. Some of these photos are candid shots of moms doing day-to-day things while also breastfeeding, and some are staged (even professional) photos designed to capture and share breastfeeding as the focal point. Still other viral posts have been more activist in nature. Take, for example, this post from Ashley Kaidel, a Florida mom who posted a picture of herself nursing in a restaurant while staring down a glaring onlooker. Indeed, social media has been a common battleground for the rhetorical war to garner social support for breastfeeding with organized campaigns of breastfeeding photos that truly are beginning to make a difference in the way the public perceives the act. 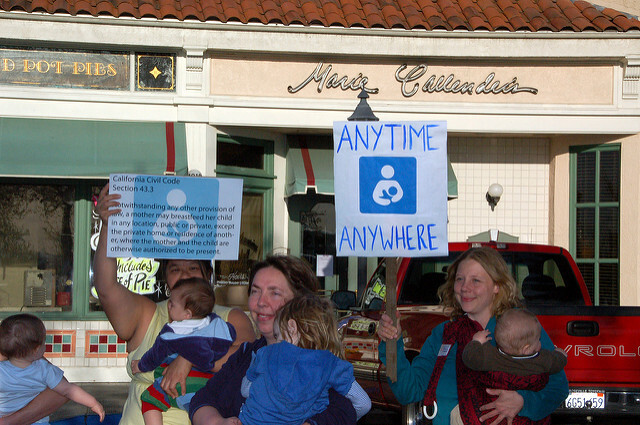 Online and in-person ("nurse-in") protests have also helped spread the word about the legal rights of mothers to feed their babies and have hopefully made store managers and meddlesome employees think twice before shaming a breastfeeding mother or kicking her out of a public space. Social media has not only served as a space to project breastfeeding outward to the world at large. It has also served as a space to cultivate inward-focused networks of nursing mothers who help each other out with struggles and provide a sense of support and community. In fact, participation in such online communities of breastfeeders has been linked to more success with breastfeeding. I could go on and on and on and on with comments like these, and I intentionally chose comments that were attempting to take a middle ground, people who suggested they weren't wholly against public breastfeeding. There are also plenty of downright abusive and cruel comments that call the women horrendous names and shame them outright for daring to leave their houses with breasts and hungry babies, but that's not what I want to focus on right now. I believe that we've turned a corner and that most people understand that (whether they like it or not) public breastfeeding is going to happen because women have a right to feed their babies. I'll go so far as to say that I think most people even agree with that right. However, I do not think we've reached a point where most people accept the reality of it, and that's why these viral "brelfies" matter. Women aren't posting pictures of themselves breastfeeding to "flaunt it." In a world where breastfeeding is truly accepted, a picture of a woman breastfeeding her infant would raise no more eyebrows than a picture of a woman eating a salad. It's the same act (nourishment) and could be posted for the same reason (to share a brief moment of our daily lives). However, most of these pictures are posted with an agenda, and the agenda is to promote a public narrative surrounding breastfeeding as acceptable. I'm down with that agenda, and I applaud the women who feel emboldened or carefree enough to engage in it. The comments on those photos remind me of comments on photos of women who confidently and purposely display plus-size bodies. Every time I see one of these body positive posts, I also see people saying some version of this: "It's fine to love yourself, but I don't want to see you loving yourself." If you feel the need to make that comment, you have to accept that you are actually not fine with it. Maybe you know you should be fine with it. Maybe you even want to be fine with it. But the fact that people are drawn to police the boundaries of public displays of these bodies means that the bodies are still stigmatized and shamed. While nominally accepted and legally protected, breastfeeding is still not a cultural norm. If breastfeeding is oppressive to women (as was argued above), then the oppression comes not from the newborn who needs to eat but from a culture that makes a mother feel like she's trapped by that constraint. When everything from maternity leave to workplace policies on pumping to the way that women are treated when they nurse in public aligns with principles of equality, acceptance, and support, breastfeeding will cease to have these oppressive qualities. Until then, the pressure to hide away while nursing will continue to have oppressive impacts, and the sense of solidarity and community in seeing other women nursing (whether in person or on social media posts) will help to combat that stigma and oppression. I asked my Facebook friends what their experiences were surrounding public breastfeeding, and I got some interesting responses. Helen wrote about her experience nursing her son: "I remember him fussing like crazy on a train once when I was by myself and the women in the carriage saying 'it's okay. You can feed him.' And feeling immense relief that I wasn't being judged. With my daughter I felt empowered by sharing photos online feeding her with other mums and this helped increase my confidence." Marcy wrote, "My second was a CONSTANT nurser, he fed like all the time. I would have had to just stay home all the time if I had wanted to avoid nursing in public. I think that really helped me get over things." She also noted that she has "often seen other women breastfeeding in public and want[ed] to give them a high-five or as solidarity." Amber wrote that she spent the first few months pumping to avoid public feedings, but when she forgot her cooler, she had to quickly get over the discomfort: "Living in San Diego, I didn't feel like I faced any issues or judgement - once I let go of my own issues. I nursed with a cover, but plenty of women don't use one. I had some negative experiences while traveling in the Midwest, though. Even with the cover, nasty comments and side-eye. Most of my interactions were very, very positive - from other moms asking where I got the cute cover to waitresses asking if I'd like another chair brought over to prop up my feet." Candis likewise tried to pump and use bottles in public: "I worried about being judged, but I'm also just really reserved so I didn't particularly want to breastfeed in public. I tried a few times with a cover, but my daughter is easily distracted and hated the cover on her face; I think I gave up trying more from the fact that I felt we couldn't do the whole thing gracefully more than I did from worrying about people judging my body. We were a flailing mess!" Mary makes her decisions about how to feed in public based on practicality: "Sometimes I pump and bring a bottle based on convenience based on what I am wearing but as I've found more breastfeeding friendly clothes that has been easier (yay subscription boxes!). Mama's Milk Box is what I use." I see a couple of themes emerging from these comments. First and foremost, seeing other breastfeeding mothers seems to be a positive, affirming, and community-building experience. This is important to remember when we want to question why someone who would share a picture of themselves nursing or decide to nurse in the middle of a wedding. Their actions are not just individual, and these public displays are shaping the discourse surrounding breastfeeding in a way that is making more women feel comfortable and confident in their choices. Finally, I was drawn to Mary's comment about clothing, and she mentioned that she uses Mama's Milk Box, a subscription service that delivers breastfeeding-friendly clothing options to your door. That got me thinking about how this whole thing has come full circle. In this post, I started with the article by blue milk that discussed how navigating the demands of working and parenting is a negotiation within capitalism. Capitalism and the formula industry's marketing strategies were also the impetus for the "Breast is Best" campaign rhetoric that made so many women feel oppressed by pressure to breastfeed. Capitalism weaves its way into every facet of our society, and I think the fact that subscription box services catering to breastfeeding women exist is a sign that things truly are changing in public perception, and that's because breastfeeding women have fought for the right to be seen, heard, and accepted. While I don't like that money is often the most obvious marker of power in our society, I think that things like subtle changes to the way formula companies portray breastfeeding more positively, the existence of companies like Mama's Milk Box, and the display of breastfeeding supplies in mainstream stores demonstrates that the tide of public perception around breastfeeding is changing rapidly. I hope and believe that market power is a precursor to policy power, and that is how we can begin to address things like maternity leave and other issues surrounding not just breastfeeding, but the successful navigation of parenting and caregiving in general. The next time you see a social media post of someone proudly breastfeeding, I hope that you'll see it not as a selfish display of voyeurism but as a public demand of much-needed visibility and acceptance.